Patients who are bedridden for long periods of time are especially susceptible to pressure ulcers, sometimes called bed sores. These painful ulcers happen when the skin has been put under repeated pressure or stress, reducing blood flow to the affected area. The incidence of pressure ulcers that occur in hospitals is on the rise, with U.S. Centers for Medicare and Medicaid Services (CMS) data showing the condition occurring in 4.5 percent of all hospitalized patients. What’s more, patients who develop pressure ulcers in the hospital are more likely to have longer stays, a higher risk of death and be readmitted within 30 days of discharge. To help improve patient safety and clinical outcomes, Trinity Health, parent organization of Lourdes Health System, has provided Lourdes with a $382,000 grant to pilot a unique monitoring device called the Leaf Patient Monitoring System. The system is manufactured by Leaf Healthcare of Pleasanton, CA. (http://www.leafhealthcare.com). Other hospitals utilizing the Leaf Sensor technology have reported significant improvements in adherence to patient turning protocols and reductions in hospital-acquired pressure ulcers by as much as 85 percent. 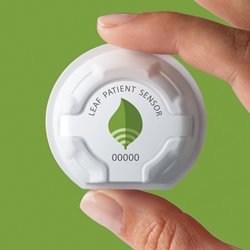 The lightweight, disposable Leaf sensor is placed on the patient's chest. Its triaxial accelerometer then automatically measures the patient’s position, movement and activity and wirelessly transmits the data to monitoring stations easily viewed by clinical staff. The Leaf system provides alerts to staff so patients are repositioned according to their individually prescribed turning schedule, and confirms adequate pressure reduction is performed. The sensor registers independent patient movement and automatically adjusts the schedule accordingly, saving staff time when patients reposition on their own. Alerts can also be set to a specific position to ensure pressure is offloaded for an existing wound or a particular area of concern. In addition, the system stores data which will allow for in-depth reporting on a number of patient mobility variables. Traditional measures for preventing pressure ulcers include daily visual inspections, changing a patient’s position every two hours and using items like pillows, foam padding and specialized mattresses to reduce/redistribute pressure. Lourdes Health System is one of the region’s leading healthcare providers, recognized nationally for excellence in clinical care and service to the community. The health system has two acute care hospitals, several community-based ambulatory care centers, and an Accountable Care Organization (ACO), which has over 200 physicians and provides coordinated, comprehensive care across physician practices, hospitals and other healthcare providers. Our Lady of Lourdes Medical Center is consistently ranked as one of the top hospitals in the nation for heart care. It is the only hospital in New Jersey, Pennsylvania or Delaware ever to have been awarded the American Hospital Association’s top honor for excellence in community outreach services. Lourdes Health System operates Our Lady of Lourdes School of Nursing; LIFE at Lourdes, a program for All-Inclusive Care of the Elderly (PACE); and various outreach programs.